Ellsworth Raymond “Bumpy” Johnson was an American gangster in Harlem, New York in the 20th century. He has been the subject or character of a number of Hollywood films including The Cotton Club, Hoodlum, and most recently, American Gangster. Johnson was originally from Charleston, South Carolina. During his formative years, his family moved north to Harlem. He was given the name “Bumpy” due to a large bump on his forehead. Known for his “flashy” style and dapper look, Johnson was at various times a pimp, a thief and a burglar. He was always armed and did not hesitate to resort to violence to achieve his objectives. By his 30th birthday, Johnson had spent almost half his life in prison. During those periods of incarceration he read incessantly and developed an affinity for writing poetry. Some of his poems were published during the Harlem Renaissance. Despite his talent, his constant clashes with other inmates and guards resulted in spending more than three years of a ten year sentence for burglary in solitary confinement. Because of his difficult and abrasive attitude, Johnson was transferred to various prisons until his release in 1932. Upon his release from prison he was financially destitute and desperate for employment. In the early 1930s Johnson became an associate of mob boss Stephanie St. Clair who dominated the numbers racket in Harlem. He quickly gained her trust and became her principal lieutenant. It was rumored in some circles that the two of them were romantically involved although she was 20 years older. Johnson and St. Clair attempted to wage a futile war against New York mob boss Dutch Shultz (born Arthur Flegenheimer). The fight between St. Clair and Johnson against Dutch Schultz and other organized crime factions in the early 1930s resulted in over 40 murders and several kidnappings. With control over police protection and influence at City Hall, Shultz and his allies in the Mafia eventually dominated the Harlem numbers rackets. 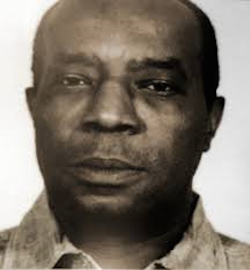 Johnson who had earlier fought against Shultz and the Mafia was eventually won over by the promise that he would run the Harlem operations in exchange for protection by the Mafia then led by Charles "Lucky" Luciano. The arrangement lasted for four decades. In spite of his “tough guy” persona, Bumpy Johnson became known to Harlemites for his help of cash and gifts to many impoverished blacks in that community. Despite his “control” over organized crime in Harlem, Johnson was frequently in and out of prison. In December 1965, frustrated by police surveillance of him, he staged a sit-down strike at a police station and refused to leave. He was arrested and charged with “refusal to leave a police station” but was later acquitted by a judge. Ellsworth “Bumpy” Johnson died in New York City in July 1968 of a heart attack. Previous Previous post: Browne, Theodore R. (c. 1910-1979).